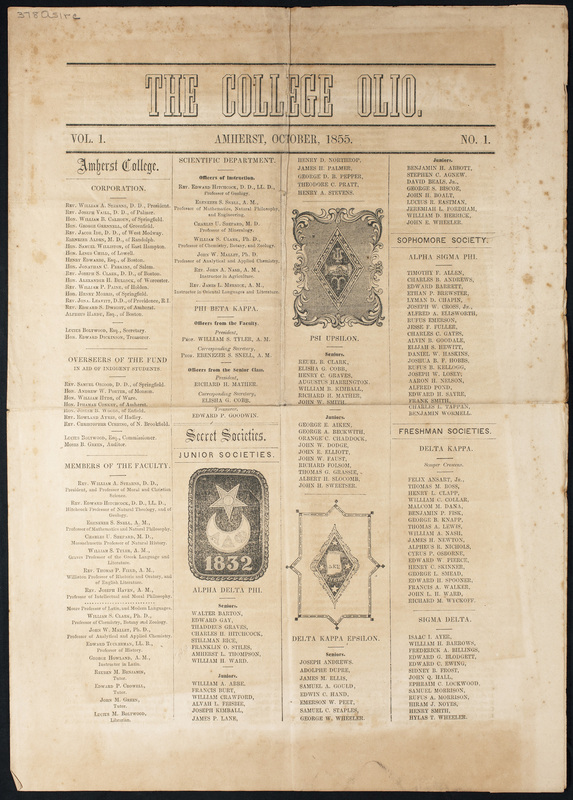 The very first instance of what eventually became the sort of yearbook we know and love today appeared under the title The College Olio in October 1855. The 1828 Webster’s dictionary definition of “olio” is “1. A mixture; a medley. 2. A miscellany; a collection of various pieces; applied to musical collections.” That term fits perfectly for this first effort with its mix of membership lists, award winners, and items of college news. The student paper — The Amherst Student — would not appear until 1868. 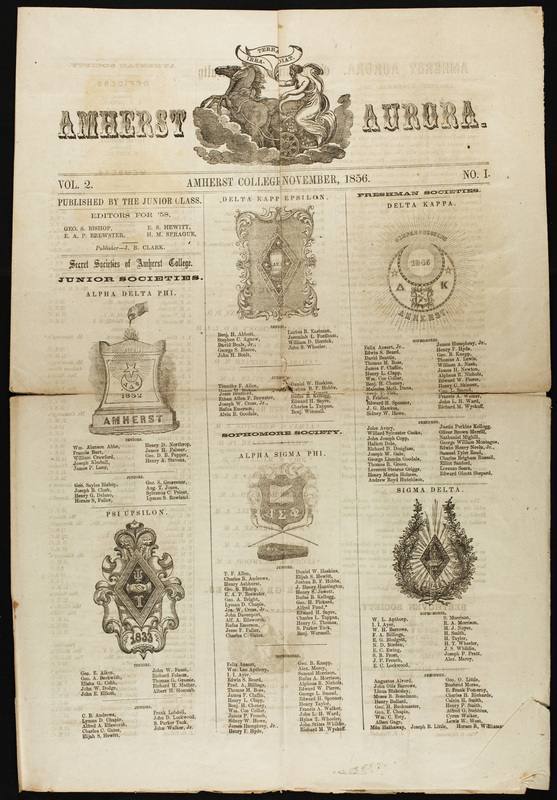 The next year, a similar publication appeared under the title Amherst Aurora. It is numbered “Vol. 2 No.1” indicating that it is a continuation of the publication originally titled The College Olio. By 1857, the third volume of the paper settled on The Olio as the title, which has stuck ever since. After the Civil War, The Olio appeared in a pamphlet format with many more pages in a smaller size. 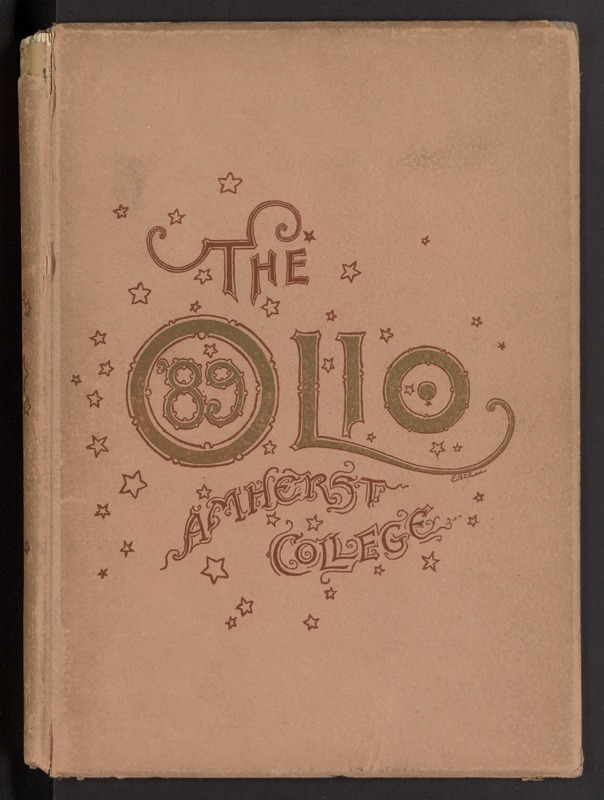 By the end of the 1880s, The Olio took the form of what we now think of as the standard yearbook format — a hardcover volume with photographs documenting college life. Though few in number in 1889, the spread of photography would eventually result in yearbooks that were almost entirely photographs with very little text. One striking feature that is consistent from 1855 until 1984 is the prominence of “Secret Societies” or, as we now know them, fraternities. 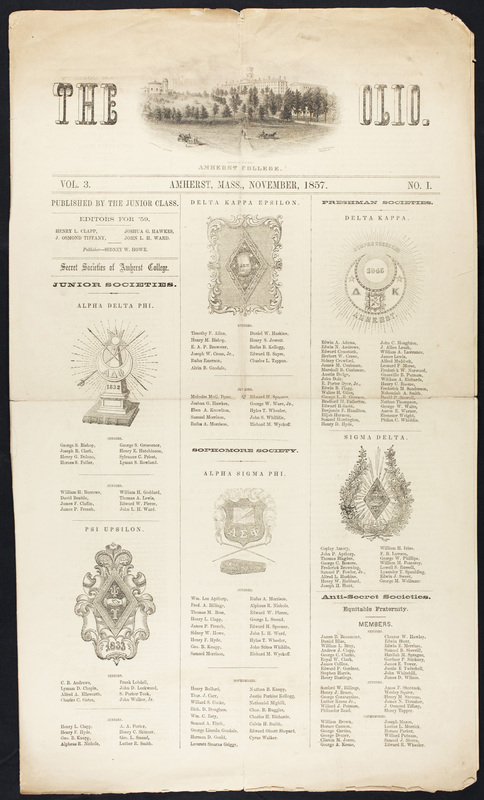 Secret societies dominate the front pages of the very earliest issues (shown above) and remained a major element of The Olio until fraternities were abolished in 1984. 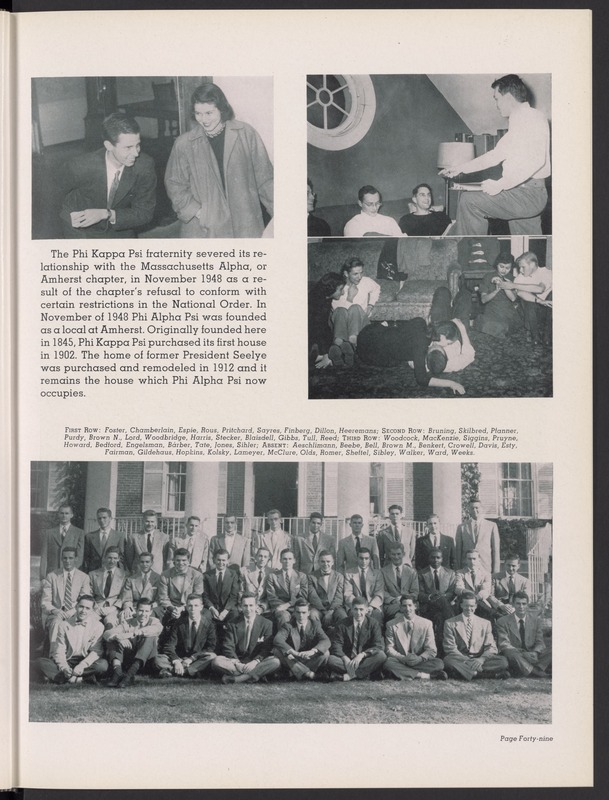 The 1951 edition of The Olio prominently features a fraternity that took an important step in the long history of the Civil Rights movement in the United States. In 1948, Thomas Gibbs III, an African-American student at Amherst, pledged Phi Kappa Psi. A fuller account of what followed can be read in The Company He Keeps: A History of White College Fraternities by Nicholas Syrett, so I will just give the short version here. After the college abolished fraternities in 1984, the house in which Thomas Gibbs III lived with his fraternity brothers was rechristened Drew House, in honor of Charles R. Drew (AC 1926). Although Drew was highly respected as a scholar and an athlete during his time at Amherst, Thomas Gibbs was the first black student at Amherst — or anywhere else in the United States — to break the fraternity color barrier.